Digital education and distance education programming and support is distributed through academic units, with the intent to meet the university’s vision of “quality, reach and service” rather than expand ISU’s market. Centralized IT, centralized teaching and learning, and close coordination with faculty/instructional staff for professional development is clear and effective. The University Senate created the Center for Excellence in Learning and Teaching (CELT) in 1993, which retains an Advisory Board (Senate committee). Online and Distance Learning are connected, but not clear that all were part of the same formative process. IT is organizationally within Academic Affairs, but with its own Interim Vice President/CIO. CELT and IT Services seem linked to a degree, with some of CELT (Learning Technologies) co-located physically with IT Services. The other (possibly pedagogical) services of CELT are physically located in a separate, central building. Faculty engagement with digital education initiatives and activities is hard to identify. The Office of Online and Distance Learning coordinates credit and non-credit courses and programs, but these remain housed in individual academic units, both on campus and at a distance. Detailed student numbers and breadth of offerings are not available through their web presence. Courses are delivered through a number of methods and focused on the entire state. Each school and college has their own coordinator for online programs. There are hundreds of online courses, at least 1 online undergraduate degree, 27 online graduate degrees, and 26 online certificates. The Online Learning Innovation Hub is physically located in Parks Library, a central location on campus, for easy faculty access. 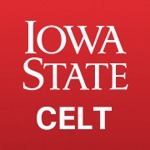 Since 2012 Iowa State (through its CELT) has been part of a 22-university Center for the Integration of Research, Teaching and Learning (CIRTL) grant ($5 million) for the professional development of graduate students and post-docs–primarily in STEM fields–as innovative, technology teachers. In 2014, the Sloan Foundation provided $550,000 to Iowa State for CIRTL network information technologies development. There is a Community of Educational Technology Support (ComETS) which promotes dialog and events focused on learning and teaching technology, including a Techstarter interface for people to post ideas they are interested in, with a gauge to measure interest from others. Continuing education and online programs are only very loosely coordinated across campus. Awareness of community/coordination activities, such as Techstarter, seem to be limited across campus. The most recent initiatives for educational technology development are relatively new to the university, with outcomes not yet tested. On June 1, 2015, UO staff (Kassia Dellabough, Kirstin Hierholzer, Lindsey Freer, Greg Milton) conducted a conference call with Ann Marie Vanderzanden, Director of Center for Excellence in Learning and Teaching, Jim Twetten, Director of Academic Technologies (Information Technology), and Ralph Napolitano, Associate Director for Online Education, to explore in greater detail the dynamics of change and development in technology-enhanced programming at Iowa State University. Three questions were used to frame the discussion, which then developed along lines of interest for the participants. Development of digital education at Iowa State (ISU) is not driven by a desire to increase market, but to meet the university’s vision of “quality, reach and service”–an extension of the university mission, not a new one. There is some interest in reaching new audience – perhaps making ISU more accessible to place-bound Iowa audiences through continuing education and online master’s programs, or by increasing professional development for specific industries, such as engineering. Digital education efforts are not centralized – instead, central services support efforts at the school or college level. There is some recent effort to better coordinate and promote digital education efforts, through the new position of Associate Director for Online Education in CELT and a current Presidential Initiative for Flipped Class Development. Culturally, there is no distinction between online and offline courses–they’re “all Iowa State.” An assessment and review of faculty and students for teaching IT needs was conducted a few years ago to understand the learning ecosystem at ISU–the results have guided faculty development programming decisions. And in recent years, conversations on campus with regards to the value of teaching with technology have been accelerating. Iowa State is a Quality Matters member, and uses QM processes and rubrics to develop a common vocabulary across campus. There is a robust committee system to help the distributed units of Iowa State (including seven colleges, the library, and 2 online course production units) collaborate, including a DE task force with representatives from all colleges. An innovation fund started 25 years ago distributes student fee dollars through the Computation Advisory Committee, including a $110/semester tech fee (variable higher amounts for some colleges/schools). In addition, distance students (taking courses online only) pay the tech fee and a delivery fee ($150-$250/semester) in place of campus service fees. All distance students pay in-state tuition rate. Some academic units provide waivers for the delivery fee depending on individual situations. Money from these fees is distributed in varied ways – to college/schools, to departments, to service unit – in accordance with individual agreements determined program by program. The flipped Course Initiative has a $250,000 fund from the President’s Office, which provides for faculty stipends, graduate student support, and software/application licensing, among other costs. Participants apply through an RFP process.